Large Laptop Backpack,High Capacity TSA Durable Luggage Travel Laptop Backpacks,Water Resistant Extra Big Student College School Backpack for Women Men with USB Port, Fits 17 inch Laptop & Notebook | Replicafer Co. DURABLE & MULTIPURPOSE: Made of Water Resistant Durable polyester fabric for lasting durability (Please note that it could prevent slight splashing rather than heavy rain). 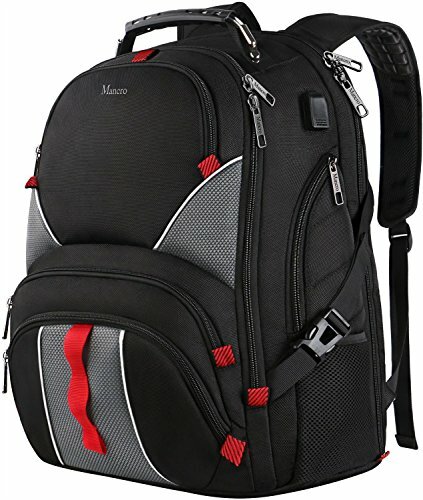 The black rugged handle and lined with steel cable provides strong and long-lasting performance with maximal weight.Serve you well as travel laptop backpack, travel business backpack, large capacity laptop backpack,men travel backpack, high school student backpack, school student backpack,heavy duty backpacks.